The vitality and distinctiveness of the Denver economy are driving new businesses and households to relocate to the metro, propelling apartment demand at a rate greater than supply growth. Drawn by the strong job market and high quality of life, new residents boosted population growth in the last year to more than double the national average. hiring increase. This positive trend in employment is expected to continue, which will keep developer optimism high, drive multifamily demand, and lead to increases in rents and multifamily asset valuation. Also contributing to the demand for apartments is insufficient single-family home and condominium construction, and the high price of existing homes. Home construction still is far below its prerecession levels, propelling the increase of home prices and apartment rents as new residents seek out living space. Builder confidence and the construction pipeline expanded under these conditions, and developers are anticipated to deliver a record 12,000 or more units this year, or over 32 percent growth in apartment deliveries since 2014, and a 4.8 percent increase in the total rental stock. Nearly half of all completions this year are concentrated near Denver’s urban core. 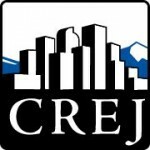 In 2016, the majority of new construction will remain focused in central Denver. Though there have been a large number of completions in the Denver metro, high demand market wide for apartments continues to suppress vacancy levels. At the market level, average vacancy continues to defy expectations as the rates remain on a slow downward trajectory. That said, vacancy is rising in areas where development is heavily concentrated in the urban core and the tech center, where average vacancy rose above 5 percent in the second quarter. Vacancy remains tightest in the older suburban submarkets, where average vacancy is below 3 percent. Looking forward, strong housing demand should prompt a 10-basis-point drop in vacancy by the end of 2015, with net absorption close to 12,400 units. Since 2010, Denver has ranked among the top major metros for rent growth, posting annual gains well above 5 percent. Given strong apartment demand, many new complexes hitting the market are recording short lease-up periods, enabling the monthly average rental rate to grow at one the fastest paces nationwide in 2015. This, in turn, has curbed concessions with less than 1 percent of professionally managed apartment complexes offering concessions. 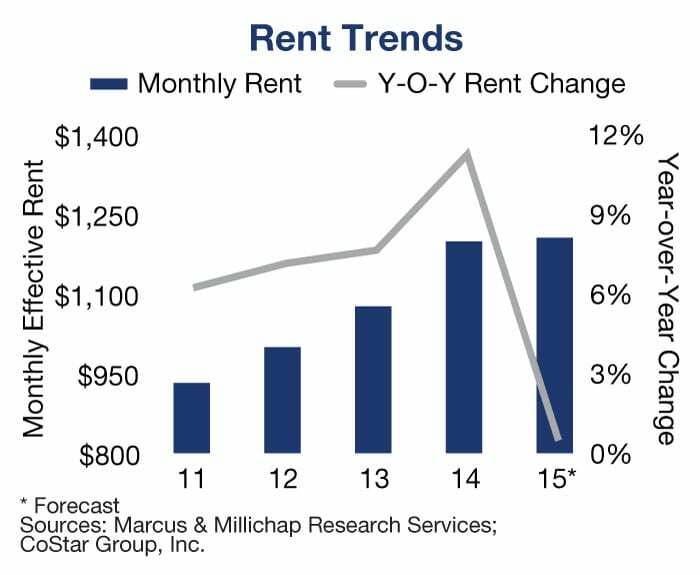 Tight vacancy contributed to rising average rents, which are projected to increase to $1,335 per month in 2015. Rapid population growth and residential demand will sustain rising home prices and expedite rent growth, as single-family home and condominium construction activity remains below their previous peaks. Recognizing these trends, investors are flocking to the Denver metro in search of higher first-year yields than are available for properties in the primary coastal markets. Consequently, suitably priced assets are generating numerous offers, which escalates prices. The dominant force in the market continues to be private investors, driving up deal flow in the $1 million to $15 million range. Going-in capitalization rates for this asset bracket average in the high-5 to high-6 percent range, depending on quality, renovation potential and location. That said, low vacancy and rising income streams will drive up net operating incomes in the B and C asset classes, continuing to attract a wide variety of investors from across the country. This is demonstrated in a 35 percent spike in deal flow and 40 percent surge in total dollar volume in the metro over the four-quarter period ending midyear. Another factor demonstrating competition within the non-A Class product is the narrowing gap between going-in yields among product classes. Many Class A and B assets across the metro and Class C assets in the more desirable locations are all experiencing going-in capitalization rates in the sub-6 percent range, with Class B and C assets attracting investors that are looking to renovate and increase net operating incomes, projecting approximately 20 percent leveraged 10-year internal rates of return. In the first half of the year, overall transaction velocity was significantly higher than the same span last year, as valuations along with the pending rise in interest rates helped motivate sellers to expedite their transaction timelines. However, the short supply of for-sale inventory versus buyer demand continues to intensify competition to secure assets among private investors, especially in well-established submarkets with less new construction opportunities. Additionally, the wealth of newly built complexes will create opportunities for institutional buyers. Both well-funded private equity and institutional buyers seeking additional yield likely will focus on listings in the southeastern portion of the metro, especially in Centennial and Aurora. Continued aggressive pursuit of assets in these areas is expected to continue through the end of the year and into next, largely due to the expansion of the metro’s light-rail line that will be complete in 2016. Featured in CREJ’s Multifamily Properties Quarterly Oct. 21, 2015, issue.